Driving: About 8kms from Greymouth, including 7kms on SH6. Walking: About 1 hour return. Easy. Getting there: From Greymouth follow SH6 northwards to Runanga. Turn off into Seddon Street, and follow the signs to the end of Ballance Street, via Fraser Street. The parking area is at the and of Ballance Street. The path to the falls starts at the parking area. The walk to the falls is through native bush. 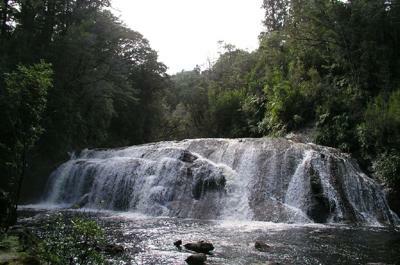 We visited this waterfall late in March 2004 on our second holiday in New Zealand. I think that I first found reference to it in a Lonely Planet guide, but I cannot find any reference in a later edition. There are several references to the falls on the internet. As I remember the track to the falls was slightly muddy in places, but it has probably been improved since our visit.